Do you know if you have a timing belt or a chain under the hood of your vehicle? It really will serve you to know what’s under the hood of your car. 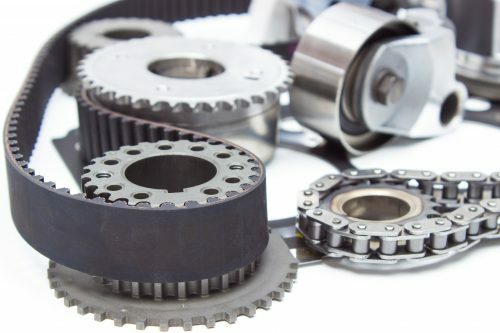 A timing belt or chain is a critical part of your vehicle and it’s a tough one to assess because it’s installed and working deep under the hood. We can’t see it without removing parts. If your timing belt lets go, snaps, cracks or breaks while it’s in use, the car quits running and you will be towed. You don’t know until it’s broken, and when it’s broken you’re broken down, and the engine’s possibly damaged. Most timing belts are made of cogged rubber, which can break or become brittle with use and over time. A metal chain usually lasts a lot longer and doesn’t have a regular replacement schedule. Timing belts have a regular replacement schedule determined by the manufacturer and can be good for 60,000- 105,000 miles before replacement. Be sure to check your owners manual for recommended replacement or give us a call and we will find out for you. It’s not a cheap fix to replace a belt, but you’ll pay less in the long run if you get your car, truck, SUV or hybrid the regular service it needs. If you’re planning to keep the vehicle for a long time, belt or chain replacement is an investment. We had a client who was ready to go to Madison, Wisconsin in a 200,000 mile Honda, and it had been 110,000 miles since the last timing belt replacement. The timing belt replacement schedule for their vehicle was 90,000 miles. We couldn’t get it done in time for him to leave on his trip, so we suggested that he go rent a Grand Caravan just for that trip. Then he had us replace the belt in his Honda when he got back. It’s not worth it. He could have been on the side of the road between here and Wisconsin, having destroyed a van that he relied on every day. All he needed was education. He was ready to go, so it’s just about letting him know. He made an informed choice that was right for him. He had a great, safe time away and knew what he needed to do to for his van when he got home. That’s how we love to work at Tom’s. We explain and share about what’s happening under the hood of your car. The service and value also come in the form of recommendations and problem-solving next steps regarding your car’s maintenance. We can even help you prioritize the tasks. It’s always your decision in the end. We want you to make the best and most-informed choice for yourself. Discover more about how the team at Tom’s Automotive Service, or schedule your next appointment now.